I bet I am not alone in this, but one of my favorite things is to find some odd ingredient in the fridge and try to figure out what I can make that will use it up that does not include, say, buying another ingredient that I will only half-use to do so. Among the many, many awesome things my apartment swap-ees left us in the fridge (Breton butter, cheese, homemade jam, oh, I’ll stop rubbing it in) they also left us stuff like cream cheese (which made for some wonderful frosting) and, well, a humble container of cottage cheese. Now, I actually adore cottage cheese (though when I used to bring it to work for lunch, people considered it odd that I’d eat it with a fork and not a spoon. Am I alone in this?) but eating it as I usually do (with a sliced up banana or mango) doesn’t make for very interesting cooking blog fodder, non? Instead I rendered it into pancakes for my next house guest (mom!) last weekend and it was indeed a delicious, delicious, thing, as reminiscent of the ricotta pancakes we made last year as it was of the flavors in the noodle kugel my mother married my father over. In other words, of course we loved them. Breakfast, previously: Not the breakfast you were hoping for? I’ve put together a Breakfast Topic Index including groupings of egg dishes; muffins and scones; pancakes waffles and french toast and other assorted morning goodies like granolas and how-tos. Check it out! I am not sure if my last, overly-confident post about how to get pancakes right every single time came back and bit me in the, uh, griddle, but I seemed to have one mishap after another–burning, sticking, dark but raw in the middle–before I begrudgingly switched to a nonstick. Perhaps you’ll have better luck than I did with the pan of your choice, but if you have a nonstick, well, it might be worth it to just use that first. Lightly butter, oil, or spray your griddle–nonstick works best with these, if you have them–if needed, and preheat it over medium heat. If you are using an electric griddle, preheat it to 350 degrees F. Preheat the oven to 200 degrees F if you do not plan to serve the pancakes hot off the griddle. Whisk flour, sugar, baking powder, baking soda, cinnamon or nutmeg and salt together in a large bowl. In a separate bowl, whisk together the milk, cottage cheese, butter, egg yolks and vanilla. Pour the wet ingredients over the dry ingredients and gently whisk them together, mixing just until combined. Stir in the walnuts and/or currants, if using them. 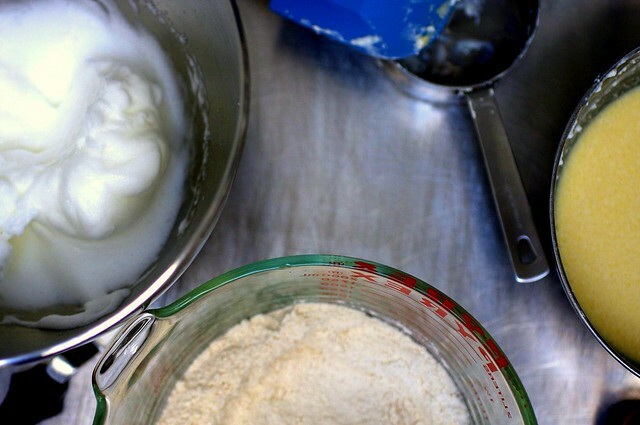 Beat the two egg whites until they are stiff but not dry and fold them into the batter. The batter will be thick and bubbly – similar to cake batter. Spoon 1/3 cup batter onto the griddle for each pancake, nudging the batter into rounds. These are thick and might take a little longer to cook than most other pancakes. Cook until the top of each pancake is starting to dry around the edges – you will get a few bubbles here and there – then turn and cook until the underside is lightly browned. These will keep in a 200 degrees F oven while you finish making the rest, but they are best served immediately, when they are at their lightest and puffiest. Oh my god, YUM. Once upon a party I ate about a full platter of very small savory cottage cheese pancakes that someone’s friend (Russian? Polish?) was churning out in the kitchen and I’ve fantasized about them since. Very excited to try these. I also eat my cottage cheese with a fork. And pineapple! I eat my cottage cheese with a fork, too! And pears. I like pears and cottage cheese. I am not the hugest cottage cheese fan but it does result in an amazingly soft textured bread. I bet those pancakes were delicious! This is a great idea for that “bit o’ cheese” left over in the fridge….I agree a fork is the way to go…cottage cheese with peaches or for savory–cottage cheese with a little black pepper and grape tomatoes. These pancakes sound delish! Thank you for the recipe. I think Hubby and I will try them tonight, with drizzles of maple syrup and side of fruit salad I put together today. Oh, and I too eat my cottage cheese with a fork. Love to throw in a chopped pear or apple with a few walnuts too. I too eat my cottage cheese with a fork and I apologize to NO ONE. Also, I use a pancake recipe a lot like this one, only with a cup of Greek yogurt (which is always in the fridge) instead of cottage cheese and it’s fantastic. Can’t wait to try your version! I LOVE these pancakes. I found a different recipe when I googled recipes with cottage cheese. I can’t even remember why I had it in the fridge but I wanted to use it up before it went bad. I made a whole batch and kept the leftovers in the fridge to eat the rest of the week (not that they lasted that long!). I like mine with syrup though. What a great recipe! And a great way to eat cottage cheese if you are one who, like me, doesn’t enjoy eating it plain. p.s I eat my cottage cheese with a fork too. What’s weird about that? These sound great! And I eat my cottage cheese with a fork, too. What do you think would happen if I used whole wheat flour instead of all-purpose? Would it ruin them entirely? Deb, I was just looking at pancake recipes online, and look what you go and post today! This looks fabulous, I’ll make them for brunch today. Thanks! Oh, and cottage cheese w/ chives = best lunch ever. I eat my cottage cheese with pineapple, and a fork! I also eat cottage cheese with a fork. I swear it tastes less appetizing with a spoon, sort of thick and metallic. I like chunks of fresh tomato with mine. I love pancakes but I don’t make them too often because my husband says then he has to eat again in a half hour. Maybe the added protein will help my cause, plus we both love cheese–can’t wait until Saturday to try them! Yogurt needs a spoon. Cottage cheese needs a fork. Or a tortilla chip. Trader Joe’s ground yellow corn chips (the ones in the blue bag) are perfect for scooping up cottage cheese. I eat my cottage cheese with salt, pepper, a bit of cayanne and red pepper flakes- and a fork. Gotta have the fork. I see you’re doing NaBloPoMo again this year, too! I’m only two days in and I’m already stressed out! I love small curd cottage cheese with sliced bananas or fresh blueberries, but now I’ll have to try it with mango sometime! As for pancakes, I don’t even bother trying to cook them on anything but my non-stick electric griddle anymore. Too many pancake mishaps when I try using anything else! You mean people eat cottage cheese with a spoon? Why? I’ve always used a fork and didn’t know that was some sort of weird thing. When I was a child, my beloved Polish grandmother would make me this fantastic open-faced sandwich: sliced hard boiled egg, sliced tomato, and a big spoonful of cottage cheese (and maybe some green onion) on seeded rye bread. Sounds weird, but anyone who tries it loves it! I also eat my cottage cheese with a fork. I don’t eat cottage cheese often and the last time was ages ago. I don’t remember what utensil I used! Maybe none..I remember liking it on toast that was smeared with apple butter..and I’m sure I just picked it up with my hands! I’ve never tried CC Pancakes. They sure look good..next time I have CC..I’ll give it a go! Thanks, Deb. What the…you couldn’t post this earlier? Dang it!!! I have half a carton of cottage cheese in my fridge and this would have been a perfect breakfast for a lazy Sunday. Wah!!!! Anything with the word pancake in it is a winner in my book. Is there one single thing that wouldn’t work as a pancake? MMmm…thanks for the Breakfast Topic Index! I’m partial to eating cottage cheese with an iced tea spoon. These pancakes sound strangely delish! And moreso, you had me cracking up with the mouse/cat problem. I often find myself wishing for a sweet little kitty… but then I wonder how I can get rid of it when it becomes large and hairy and antisocial. Mmmm. I eat my cottage cheese (Borden’s, low fat) with a small spoon (to make the delectability last longer). Using a fork means that the magical whey is lost through the tines! How sad is that? As for the pancakes, I’ll eat them with my fingers to cut out the middle man. Thanks for this blog. I also eat cottage cheese with a fork. And a sprinkling of salted, shelled sunflower seeds. Sorry I eat my cottage cheese with a spoon, however, I do mix things in it some times like sliced hot dogs and or pork and beans and always, always garlic powder. I tried the pancakes and they are very mmmmmmmmmmm good. Thanks for the recipe. I also eat cottage cheese with a fork (and pineapple) and after reading the comments I am thinking that it is your co-workers and their spoons who are the weird ones! Pancakes look yummy! I also eat my cottage cheese with a fork. I sometimes stir in some berry jam (blueberry or blackberry is my favorite) for a sweet treat. 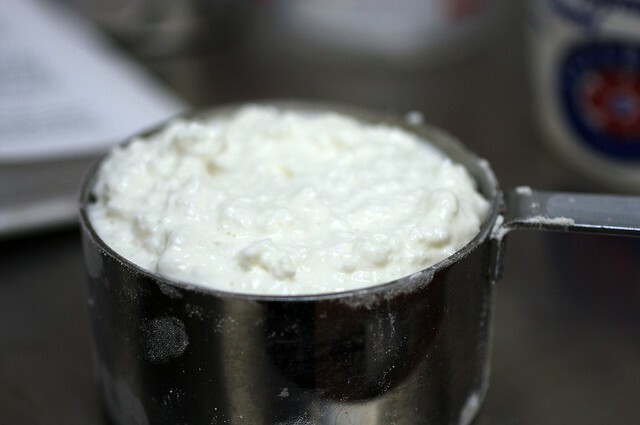 My husband makes a savory cottage cheese (eaten with a fork!). He adds tomatoes, balsamic, salt and pepper to the cottage chesse. It is SO good, and I am not a fan of cottage cheese at all. I’ll have to give the pancakes a try with the kids tomorrow. I have made them ricotta pancakes before, which I think two liked and two did not. I eat cottage cheese with a SPOON! The oval shaped soup spoon fits the inside curvature of the bowl better, and I am able to scrape the residue from the side. My other half uses a fork, and I could never understand that. I guess that’s where Deb got the fork usage from. I went to a pancake breakfast fundraiser this weekend. They served pumpkin pancakes as an option. It was actually a great change of pace from the boring same old thing. Sorry, I eat cottage cheese with a spoon. I do howeve add to it at times like sliced hot dogs and or port and beans and I always add garlic powder and pepper. I tried the pancakes tonight and they are real mmmmmmmmmmmmm good. Tks for the recp. !!! those look so good… every single time i come to your site i find some fabulous recipes and photos! thanks for this! I actually do enjoy food blog posts that may seem like boring blog fodder to other people. For example, I once saw Alton Brown put pomegranite seeds on cottage cheese and I thought it was such a simple yet brilliant combination, I can’t tell you how many times I’ve eaten that for breakfast. So if you think something is boring to post, it might not be. Us readers appreciate simple as well as complex recipes. I eat Cottage Cheese and Pineapple, or Tomatoes, pears, Peaches, or it is also wonderful to mix in fresh green pea’s and chopped onion. I always use a fork! Mmmmm. they look really great! Hmmm, I have never tried cottage cheese as a sweet like virtually everyone here has…I’ve always eaten it as…a cheese! On rye with avacado and lemon scented oil or on top of corn chips (cold though)! I suppse it’s just like never having had avacado as a savoury until I was 12…before then my dad always used to give me a half sprinkled in castor sugar with a spoon and that was that! You wanna get weird looks when eating cottage cheese? Try it on toast, with ketchup. Deeeeeelishus! But yeah, few people understand it… Apparently it was Nixon’s favorite treat too. I don’t know what that says about me that Richard Nixon and I have a shared favorite treat. I eat it with a fork too :P Salt. Pepper. Fork. Yum. Woo-hoo, something to use cottage cheese in after making the world’s best and easiest mac and cheese! Yay, yay, yah. I bet these are the same cottage cheese pancakes I grew up on! The early years of my life were spent eating a large variety of pancakes that my mom made by throwing together whatever was in the fridge. I don’t know what the fascination with the pancake shape was, but I can tell you, we were to relieved when she decided to make the cottage cheese or latke version instead of the choose your own adventure variety. I agree, these are tasty little guys! Just wanted to let everyone know that this recipe scales well for a half recipe. I also wanted to mention that the cottage cheese seems to sink to the bottom so I recommend scooping instead of just pouring out of the bowl. These look great! And I totally eat my cottage cheese with a fork. However, I find the fruit/cottage cheese combo gag worthy. I like mine with just a little salt and pepper. Yum! Ooh I think I have some cottage cheese hanging out in the fridge right now! If these are as fluffy as the ricotta lemon ones I’m sold. Interesting…I’ve never even heard of cottage cheese pancakes before! I will have to test them on my husband and see what he thinks compared to the traditional pancake recipe I typically use. Great photos by the way- you constantly amaze me how beautiful your blog is. I made this recipe yesterday for brunch and it was simple and delicious. I agree with the poster above that you’ll want to scoop the mix out of the bowl, to get an even amount of the cheese in each pancake. They were moist, held nicely in a warm oven while waiting for my friends to arrive and…gone in minutes. Thanks Deb! Fork. Green onion. Pepper. Heaven! Magdalena, I am drooling over your description of that open face sandwich! Mmmmm. Cottage cheese. I eat it with a fork and I prefer garlic powder mixed in first and allowed to meld. Jane Brody once had a pancake recipe that was said to be a good way to use up cottage cheese that was getting old. I have no idea why you would want to still eat it if it was old. I have a cookie recipe that calls for a dough of flour, butter, sugar, and cottage cheese. You roll and fold it over and over, and nobody ever guesses that cottage cheese is in this tender cookie. It has a jam filling and a drizzled glaze on top. It’s from Czech Village in Iowa, courtesy of Midwest Living magazine. I am always intrigued by cottage cheese as an ingredient, except in lasagne. I love cottage cheese, though none as much as the A&E cottage cheese of my Iowa childhood. For the best eggs ever, my mom scrambles eggs, cottage cheese, salt, pepper, tiny bits of cheddar cheese, and crutons (preferably homemade). Ridiculously good. I am a cottage cheese fanatic – I eat mine with a fork, UNLESS I am eating the delcious and weird-sounding combination of cottage cheese and canned vegetarian baked beans. My mom ate this when I was growning up, and I love it now for its sweet-meets-salty flavors. Try it! The pancakes look AMAZING! Oh Celeste, can you share the cookie recipe? Czech Village was part of my hometown growing up. I miss visiting the bakery there so much. They had the best Kolaches. I have a cottage cheese pancake recipe (equal parts cottage cheese, eggs and baking mix then thinned with milk or yogurt to the consistancy you want). I am going to have to give this one a try and see if the kids like it as well. Cottage cheese pancakes are one of those count on everyone to eat meals at our house. I usually eat cottage cheese with a fork unless I mix pineapple chunks in it, then I might use a spoon but it is a toss up. I love cottage cheese pancakes, I’ve been posting about and making these pancakes for a while now. I only use 4 ingredients: oats, cottage cheese, eggs and a banana. Puree it all together and you’ve got your batter. You can also substitute pumpkin puree for the banana, add some spice and make pumpkin pie pancakes, perfect for the season! Here are the Pumpkin Pie Pancakes if you’re curious. I too eat my cottage cheese with a spoon. I’m going to have to try these – they sound and look like the lemon ricotta pancakes I fell in love with every day of my honeymoon… yummy! I eat my cottage cheese with a fork. I also eat it with a spoon, a knife, a spatula, or any other utensil that gets in the way. But mostly I eat it with a slice or two of frozen pizza. Because frozen pizza is not worth eating otherwise! so i made these last night. you are one smart girl. i loved them!!! thank you!!!!!! Rachel, I have recently moved and I am not nearly unpacked yet but will get looking for the recipe. I will certainly share the recipe with you; my email is celesteUNDERSCORElippAT yahoo if you want to give me a shout so I can send it to you. The cookies are YUM when fresh, but they don’t keep glazed for Christmas or mailing (who cares, find some other cookie for those jobs!). Looks fantastic! And, yes, I too eat my cottage cheese with a fork. Would these work with store-brand cottage cheese, like the previous recipe where you had to use that off-brand, non-Philadelphia cream cheese that your cheapskate apartment swapper left behind for you? Oh! We love these pancakes. I add shredded apple (using the Moosewood Cooks at Home recipe). They are devoured in minutes. Fork all the whey (ho ho) for me too. The pancakes look great – a whole lot less effort than making blintzes which they seem similar to. I have loved these sirniki ever since I spent a summer in St. Petersburg with a host family. This was by far the best of the breakfast foods they ever foisted upon me (much better than hotdogs and ramen). I tried another online recipe for these, but failed miserably, I think I shall give it another shot with this one. Thanks for posting! I eat my cottage cheese with a spoon. I put a little cheddar cheese in it…Yum! I usually put this on top of my salad, but I will eat it alone as a snack. I made the cottage cheese pancakes this morning for my 3.5 yr old triplets & me. They were the best & my kids loved them. I usually love my pancakes dripping with syrup, but these did not need them. I used my cast iron pans & I can’t wait to make them for my husband tomorrow. I’m gonna try this with Ricotta. We made these last night b/c my 5 year old had begged and begged for cottage cheese and then wouldn’t eat it. Then she said she wanted pancakes. So we were able to use up the shunned cottage cheese and have breakfast for dinner at the same time. They were really good. Cottage cheese seems to do for pancakes what they do for eggs make them really light and fluffy. This looks great and I totally eat my cottage cheese with a fork too! Well, this is a recipe I’ll surely make again. Very delicious, and I’m not usually a big fan of pancakes. I placed a few fresh blueberries on the top of the pancakes before flipping them. Everybody loved them with maple syrup. Wow! It’s so good to see these again! My mom used to make them for us, and they were so light, fluffy and tender… they were, in short, amazing. The batter makes fabulous waffles too. Not of the light and crispy belgian variety, but nourishing and delicious all the same. In Russia we called them “syrniki” which means cheesy pancakes. 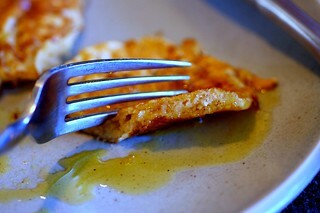 I have my own cottage cheese pancakes recipe, a little bit easier than yours but still delicious! I will try your pancakes recipe and let you know the result! Thank you! Oooh, these were good! I really wanted pancakes but didn’t have any milk. So I used a combination of cottage cheese, plain yogurt and sour cream, with a little water to thin things out. I loved the texture of these – as much of a pain as it is to beat the egg whites and fold them in separately, it really does make all the difference. 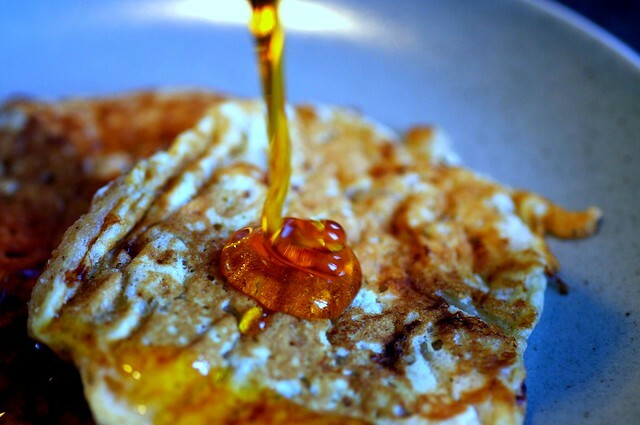 Your pancake recipe rocks! i have tried it the idea of adding milk in pancake is really good i used to add water in it thanks for recipe. WOW, I just found your website and was browsing your recipes. I found this one and decided to make it for breakfast this morning. These are so good. I am always looking to put more protein in my breakfast. I actually forgot to add sugar to the recipe and they are still wonderful. I used craisins and walnuts and then with the syrup they are still sweet and tasty. Thank you for a great recipe. I have company coming in 2 weeks and guess what they will be eating for breakfast? Deb, have you ever tried Nancy’s brand cultured cottage cheese? It’s got the cottage cheese curds plus a nice yogurt-y tang from the cultures. I bet you’d love it and I think it would add even more deliciousness to a dish like this! These were delicious! They hit the spot this morning. I didn’t even need syrup. Wow, these were absolutely amazing — the fluffiest pancakes I have ever made. I replaced the melted butter with a splash of buttermilk since I figured they’d be rich enough cooked with butter on the griddle, and it worked great! Thanks for this recipe! Greetings from Barbados. I just finished making these pancakes…i love them.I love trying recipes from your site,so far I’ve tried the broccoli slaw,and the granola bars.I also love how its set out , made me stick around the first time and check it out, Ive looked at all the pictures,everything looks soo yummy. Thanks again,keep up good work. The cottage cheese sticks to the S.S. pan! No matter what oil, spray, butter, release spray I tried, cottage cheese pancakes stick to my stainless pan and make flipping impossible. I substituted sour cream for the cottage cheese for a much, much better tasting batter and it does not stick!!! (I don’t use unhealthy non stick pans). I just made these for my kids this morning and, without question, they are the best pancakes we have ever had! I made a batch also with some tiny chunks of granny smith apples thrown in and that was a nice addition. Thanks for the “keeper” recipe! I must admit that I’ve been falling out of love with pancakes over the last few years but something compelled me to make this recipe for my boyfriend this morning, even though I despise cooking breakfast. Well, I am in love once again and no longer afraid of the griddle! Thank you. Best pancakes ever! They were great by themselves and perfect with just a touch of real maple syrup. So much flavor! Oh my god, these were the best pancakes I have ever made. And I’ve tried lots of recipes. They were almost velvety, and awesome. They took a while to cook but were well worth it. They looked just like yours did. Not as round and uniform as regular pancakes, but the way they get those little ridges like in the 1st and 5th photos look really gorgeous. I made these this morning, but added lemon zest and fresh blueberries. It was heavenly! I’d like to feature them on my blog. Is it okay with you if I reprint the recipe (as I made it), with appropriate linkbacks, of course. I just made these.. and oh.my.goodes.. I AM OBSESSED. I think i just found my holy grail pancake recipe! That was INCREDIBLY delcious.. i cant get over it! These pancakes just look mouth-watering! Just made these for post-soccer game lunch. They are delicious and filling! I’m eating these right now… they’re awesome! I used both cinnamon & nutmeg. When I was keeping the pancakes warm in the oven, I put them directly on the rack, with a cookie sheet on the rack below to catch crumbs. This worked out really well, and those pancakes stayed crispy on the outside. The hubs even loved these, and I was so happy to use up some of my cottage cheese! Just made these for my ten month old twins and they are gobbling them up! Delicious!! Yum Yum Yum! And I eat cottage cheese with a fork too! Deb, these were absolutely divine. Very soft and fluffy with little bits of crunch (because of the walnuts) here and there. Would definitely make them again. Also loved your website and the extensive recipes. Will try them out sometime. My grandmother used to make my sisters and me pineapple cottage cheese pancakes. Drained, crushed pineapple went into the batter and into her pineapple syrup, which was simply sweetened with sugar and some orange juice. Thanks for this awesome recipe. I had never been able to make such soft pancakes. I did them with no sugar at all and for my taste they don’t need any. I just sprinkled some powder sugar for the outlook. Btw, your website is made out of love. Thanks for sharing this knowledge. Cheers! This has become one of my family’s favorite breakfast foods. We love them and cook em up without currants but keep the chopped walnuts. With a sprinkle of powdered sugar or syrup these are a great meal. Thanks so much! made these this morning. substituted 1/2 cup whole wheat flour for 1/2 of AP flour. they were delicious. 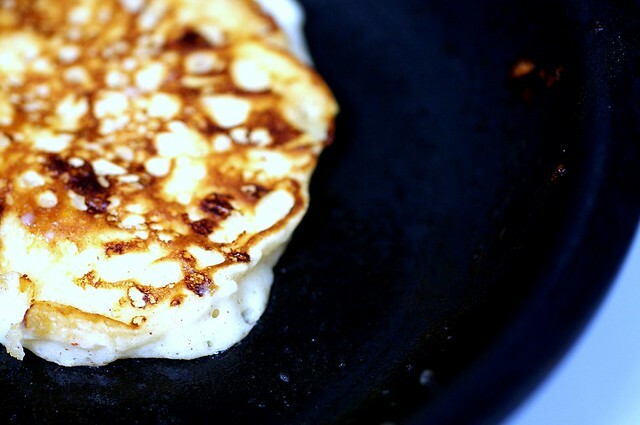 this is my new favourite cottage cheese pancake recipe! next time, i’ll put less sugar in the batter as i ate them with an illegal amount of maple syrup. So I make these all the time and realized I never commented. The kids love them, the husband (who gets very mad all the other “healthy pancakes” I have tried) loves them. They are super filling! I usually substitute 1/2 the flour for whole wheat and use brown sugar (sometimes I end up adding like an extra tablespoon of flour to make up for the brown sugar wetness). Really, these are all tips I’ve learned from you Deb! Thanks for all you do. I love fanny farmers recipe on page 497, very simple and my expanded family loves it! I forgot that I use the cottage cheese out of the container? I raised my children on a similar recipe and they loved them. Usually added some blueberries and always a tablespoon of Grandma’s Molasses. The recipe had a whole egg and a yoke and buttermilk instead of milk. As several above we also use half whole wheat half all purpose and they work well with all whole wheat. They were always good. In fact I would say they were the family favorite. These look amazing! What a great way to cook with cheese. I bet you can make it healthier by changing the types of flour and even adding healthy toppings. Thanks for sharing! I’m going to play with this one and probably feature it on my cheese blog, CheeseSexDeath.com! I love that you linked to this on Facebook with a link and a statement about cottage cheese being hip again. I’m in my late 30’s (very very very late 30’s…) and grew up eating cottage cheese ALL THE TIME. When my mom came home from the grocery store, my sister and I would argue over the cottage cheese and eat it straight out of the container. Just 2 days ago we had a series of texts about cottage cheese and remembering that we used to eat it mixed with fruit yogurt. It seems like the oddest combination, but I tried it again and loved it! I was first introduced to cottage cheese pancakes (with apple) through the Moosewood cookbook. I was leery of cottage cheese in a pancake but it works well and makes for a hearty meal. I often even make them for dinner! I look forward to trying this version. Joy of Cooking was my 1st cookbook…..learned to cook from it from my mother (before moving on to Julia Child)….and was the 1st cookbook I bought when moving off on my own. Still return there for basics. My FIL used to make these for Passover every year; he called them “chremsel” and used matzo meal instead of flour/baking soda/baking powder. That’s how I learned to make them, and have been doing so for some 40+ years now. They are a favorite of ours and I do make them the rest of the year, too, because we love them so much. But they never come out the same way twice, and I have never thought to make them with flour instead of the matzo meal (since I never had a “real” recipe — I have always eyeballed things till they looked right). I can’t wait to try them your way and finally have some actual amounts to refer to so they come out the same every time. I’m here to report that it’s ENTIRELY possible to skip the whole separating the eggs, beating the whites step all together, and still have fluffy delicious pancakes. Hi Deb! I was scrolling through the comments and usually read yours with recommendations but couldnt find any! I’ve been meaning to make these for a while, and finally I intend to make them tomorrow for breakfast! Is it possible to make the dough, say, the previous night, and leave it on the fridge? (so I can sleep longer on Sunday morning? hihihi) Thanks! Your fan n.1 from cold Finland! These are excellent! I was trying to find something to do with excess cottage cheese (I bought some from Costco, and then discovered that I don’t like 2% nearly as well as whole fat, but figured that it could be be used to make something delicious), and these use a good amount without requiring much of anything that I’m very low on. I don’t see the need to pair them with honey or syrup, although jam is a pleasant match. However, the texture is not what I’d expect from beaten egg white. I like the texture, mind, but I wonder if I either mucked up the egg white (by over beating or overly enthusiastic folding) or if it’s just not that essential. I cook with cottage cheese maybe once every couple of years and had half a container left after making your Easiest Baked Mac & Cheese (yummo!). Not wanting to be wasteful and let it spoil with failed intentions to use it up, I found this pancake recipe. 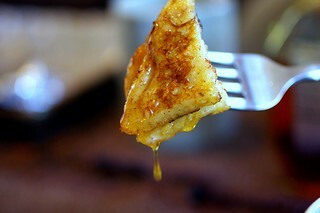 It was quite delightful but too sweet, especially since I enjoy my pancakes with a little maple syrup. Next time, I’ll cut back on the sugar. But…there will be a next time :). These are a go-to weeknight supper for us, made with half the sugar, full fat cottage cheese, and subbing in white whole wheat flour. We usually serve with plain, whole milk Greek yogurt and fresh fruit. I should add that depending on time sometimes I don’t beat the egg whites separately and they’re pretty good that way too though not as nicely fluffy.